The three-day November auction from Auktionshaus Selzer provided yet another offering of interesting toys and trains. For those unfamiliar with this auction house, it’s located in Rüdesheim am Rhein, a wonderful picturesque city located on the Rhein River in Germany. 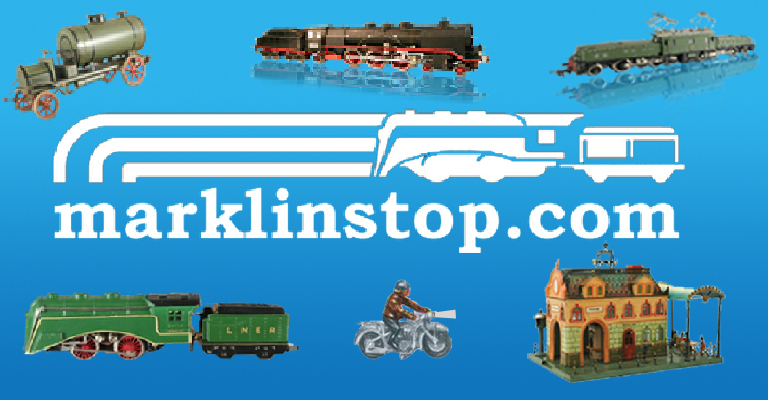 It’s one of Germany’s most popular tourist attractions and a perfect setting for the display and sale of treasured Marklin toys. Items from the Marklin Liliputbahn also made a grand appearance in the auction, despite the main clockwork Liliput train remaining unsold. The wagons fetched a high of 3,000 Euros and the hand-built houses fetched from 300 to 800 Euros. More can be read about the Marklin Liliputbahn and its history in this article. The larger gauges turned out relatively weak, an overall good offering but with many unsold lots. Notably the Marklin Central Station 2013 for the French market in creme/red remained unsold at its starting price of 6,500 Euros. A similar station also for the French market was sold in the UK from the Ron McCrindell collection and achieved a result of 5,000 GBP. The 00 gauge trains began with a selection of rarities Noch in letzter Minute eingeliefert (added in the last minute). The back-stamped 342 LMS, a model for the English market converted back with over-stamping for the domestic market during WWII, fetched a price of 1,600 Euros. Another rarity, the prototype 372, remained unsold at its asking price of 400 Euro. Here it seems the inaction from the bidders voiced a concern about the model’s authenticity. Clearly an original prototype model of this rarity could easily, and certainly has in the past, fetch thousands of euros. Following these great lots were a series of boxes of varying rarity and quality, some described as original and others as replicas. Two British rarities, the 343 LMS cars, were also passed over by bidders at a price of 300 Euros since they did not have the original LMS stamping and were sold in reproduction boxes. Lot 5179 offered a rare R 800 SLNE with an illegible LNER stamp to the tender. The bidders spoke once again that this item might not be original as it was left unsold at an asking price of 2,000 Euros. Such models are easily reproduced and imitated because of their resemblance to the common domestic version, the only difference a golden LNER stamp to the tender sides. Two red SLR 700 locomotives appeared in the auction, one newly painted and the other original. Lot 5244, the restored one, was unsold at 1.500 Euros and Lot 5270, the original, was also unsold at 4.000 Euros. The distinct paint damage to the cabin side and other areas make this locomotive easily identifiable. The same locomotive was offered and sold once before in the November 2013 auction for 6,500 Euros against an estimate of 5,500 to 8,250 Euros (Lot 5157). It is not known whether the previous buyer actually continued with the purchase or had buyer’s remorse and returned the item. Various other rarities remained unsold including models of the CCS 800, TW 800, HR 700, and SK 800 to name a few. It’s difficult to not notice the increased occurrence of restoration and reproduction boxes that seem to dampen bidder excitement. Collectors in this auction put a premium on high-quality, original items while easily passing on the lower-priced models with restoration, reproduction parts, or questionable authenticity. Ending the auction, the 00 accessories included two rare 406 Nazi flags in the original box. The flags appear to be original, differentiating themselves from the reproductions that have much darker red flags. The box as well seems original and dates from 1942 according to the barely legible date stamp. Together the pair of flags in box fetched 3,500 Euros which seems a fair price for such a rare item. 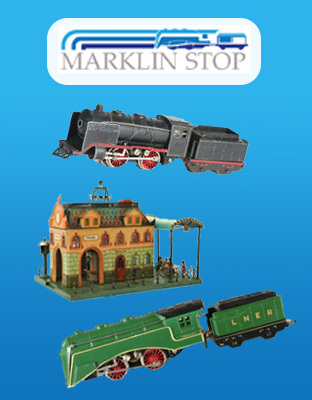 The 406 flags are one of a few models Marklin offered with the historically-relevant Nazi symbol. Reference: The featured image for this post is from Auktionshaus Selzer’s Fall Auction 2014 catalog. Once again you have hit the mark. Wonderful “stuff”.